With the Elite series Fender is moving forwards... are you? Vintage purists won't like it: many, many players will! For 2016, Fender's American Deluxe range is no more; they are now Elite. Name aside, the range is trimmed to just four guitars: the Strat and Tele, an HSS Shawbucker Strat and a thinline Tele. So, what's new? Along with cosmetic additions in the form of new colours, a refreshed headstock logo and 'soft touch' rubber control knobs, there's a new neck shape, a new wheel-style truss-rod adjustment (we lose the Micro-Tilt adjustment) and slightly altered-shaped heel geometry. Then we have the latest (fourth) generation of Noiseless pickups controlled, as before, by the S-1 switching, activated by a push/push switch within the top of the volume control's knob that expands the sounds from the five-way or three-way pickup selector switches. "Fender provides choice, right across the price spectrum. If you want vintage spec, it's there; if you want more contemporary, no problem." If you've experienced the previous Deluxes, you'll know they're all about subtle upgrades, which are ongoing here. On the Elite Stratocaster, there is slightly deeper contouring, noticeably on the back rig-cage contour, and as before we have a compound-radius fingerboard with jumbo frets. Body wood is colour dependent, but a choice of rosewood or maple 'boards is available on all. The hardware stays the same: the excellent twin-post vibrato, with its six block saddles and pop-in arm, and the sealed, chromed rear-lock tuners (although instead of the previous dual-height string posts, they all have the lower height posts, which subtly increase the back angle behind the nut on the bass strings). A new-design string tree increases that back angle further on the top two strings; another change is the bone nut. Its Light Blue Metallic finish with darker blue sunbursting might look a little Las Vegas close up, but it makes for a vibrant stage colour, contrasted by the more vintage-y mint-green laminate scratchplate. Thanks to both 'Fender' and 'Noiseless' silver logos, these clearly aren't vintage pickups. Overall, a very tidy job, a little on the heavy side perhaps, but easy to live with. Okay, so the new neck shape is nothing too dramatic. The spec's C-to-D shape seems pretty subtle; as you move up the neck, the shoulders of the lower position's C shape seem to fill out slightly, giving a subtle flat back, more of a contemporary feel perhaps, which suits the compound radius and bigger frets. The Strat is set up low with 0.009s, creating a pretty mainstream feel, but, of course, there's no 'right' way to set up your Fender. The important thing here is that the new truss-rod adjuster - as any Music Man owner will attest to - means neck-relief adjustments are now dead simple. "Plugging in the Strat after a quick play of our reference Roadworn, we're reminded just how a different setup and string gauge can massively influence what we hear." 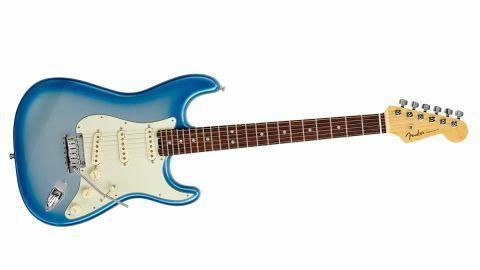 The Strat has a S-1 switch out, it's classic Strat; push it down, however, and we have five different selections. Tone control 1 takes care of the neck pickup, while the No-Load Tone 2 looks after the middle and bridge pickups. Plugging in the Strat after a quick play of our reference Roadworn, we're reminded just how a different setup and string gauge can massively influence what we hear. There's a lighter, brighter tonality to the Elite and raising the action and increasing the treble-to-bass stagger on the pickup heights narrows the gap a little, as does pulling back the No-Load tone control. There's obviously a big difference in the pickups - our Roadworn has retro-fitted Custom Shop Texas Specials - and the Elite sounds more classic. But despite a less-pronounced magnet stagger, to our ears, the second-string response is a little 'soft'. The Elite does sound more refined, not quite as 'dirty' or as raw as our Roadworn, but with a touch more output. Switching the S-1 switch down on the Strat really does take us to a different place. Selecting the middle pickup and switching in the S-1, it's as though you've kicked in a thickening boost: more humbucking, with more power and low end, plus there's a little 'cocked wah' to the highs. Moving to the middle-and-neck combination, the change is more dramatic, like you've cocked that wah pedal back further, losing the shimmering highs. At the neck, with the S-1 depressed, we have a similar voice with some of the highs restored. The bridge-and- middle position is less contrasted, sound slightly harder and a little phase-y; the bridge position is the most subtle. As our test time continues, the neck shape is interesting, because we really didn't notice it; likewise, that compound camber. The series linkages really do add a different voice that loves crunch and gain. Conversely, switch to a clean amp, pull the volume down and select the S-1 neck position and you're good for your jazz gig. Knock it back to middle and neck, wind up your gain and it's a big rock rhythm sound. other passive single coils we had on hand. Working in front of our laptop, or stuck close to your amp on a cramped 'stage', there is virtually no hum pickup whatsoever. At higher gains and volumes, however, you will hear some hum pickup, but in every scenario, it is way less than our standard single-coil guitars. Fender provides choice, right across the price spectrum. If you want vintage spec, it's there; if you want more contemporary, no problem. It's the latter that the Elites aim for and, not least at the price, they cram in a lot of upgrades; and then there's the duality of the S-1 switching. Our test Strat is a little heavy, and that slight imbalance of the second string won't work for every player. But its voice is nicely classic: engage the S-1 switch and it's 'game on' for those of us who find a Strat a little hard work.